President Obama was getting booted from the White House and his administration was right behind him. It was an exciting day to say the least for Americans who understand the reality we are in. However, not even a full day into his term, President Trump fell under a violent assault from the left. 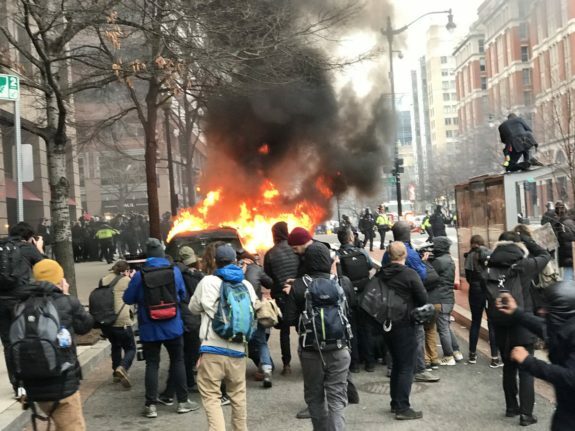 Hundreds were wreaking havoc in Washington D.C. that very night, smashing windows and burning up property that wasn’t theirs. Idiot savages. Here’s the thing that these sluggish thugs from the left don’t get. Being ticked off does not give you the licence to act like a criminal or pick and choose what laws you want to abide by in the name of social justice or whatever else they were out acting like fools over. There’s a new President in town and this kind of crap is not going to be tolerated any longer. CNN reports that a total of 214 people have already been indicted thus far on felony rioting charges. All of them connected with the crap that went on during Inauguration Day protests in the streets of downtown Washington, D.C.
On the morning of January 20, protests over Donald Trump’s inauguration turned violent when black-clad “anti-fascist” protesters smashed storefronts and bus stops, hammered out the windows of a limousine and eventually launched rocks at a phalanx of police. The indictment accuses the defendants of using a tactic called “Black Bloc” in which people conceal their identities with dark or black clothing and accessories such as scarves, sunglasses, helmets and masks. Asshats…if that’s what you call letting off a little steam, you need to be locked up for a long period of time with some major counseling on how to locate your humanity. At least it’s good to see that justice is making her way through the crazies and teaching them all about what consequences to actions can bring.